Believe me, with this easy Yorkshire Pudding recipe you will never buy ready-made ones again, guaranteed. This well-proven recipe is used around the world and with a promise your puddings will rise golden and delicious every time. 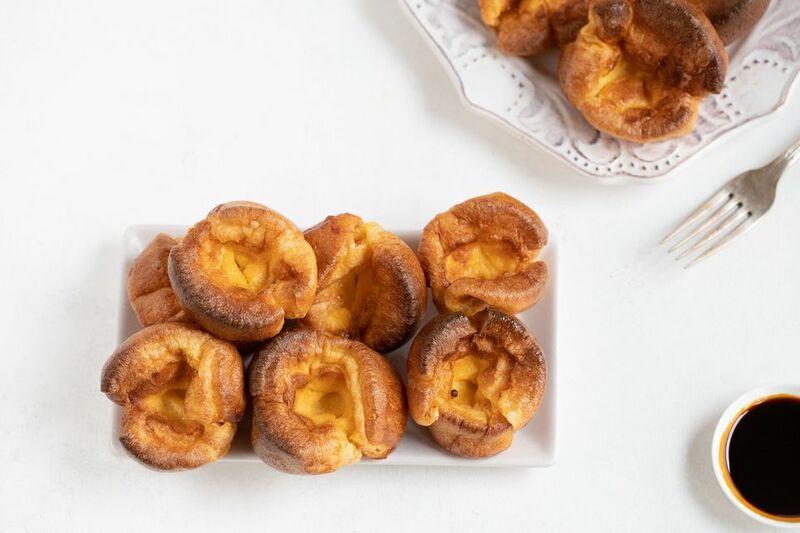 While Yorkshire puds are a classic British recipe and one of the major components of England's national dish - ​roast beef and Yorkshire puddings - a regional dish with national (and international) appeal, they don't always need to be served with a Sunday roast. Instead, think of making them for a midweek supper. Children love them especially with gravy. In Yorkshire, the pudding is traditionally served with gravy as a starter dish followed by the meat and vegetables. More often smaller puddings cooked in muffin tins are served alongside meat and vegetables. Heat the oven to the highest temperature possible, however, do not exceed 450 F/230 C or the fat may burn. Gradually sieve the same volume of flour (as the eggs) into the milk and egg mixture, again using an electric hand beater or hand-whisk to create a lump-free batter resembling thick cream, if there are any lumps pass the batter through a fine sieve. Leave the batter to rest in the kitchen for a minimum of 30 minutes, longer if possible - up to several hours. Place a pea-sized piece of lard, dripping or 1/2 teaspoon vegetable oil into your chosen Yorkshire pudding tin, or a 12-hole muffin tin and heat in the oven until the fat is smoking. Give the batter another good whisk adding 2 tablespoons of cold water and fill a third of each section of the tin with batter and return quickly to the oven. Leave to cook until golden brown - approximately 20 minutes. Repeat the last step again until all the batter is used up. The secret to making Yorkshires, as they are fondly known, is to pour well rested, cold batter into slightly smoking hot fat and put immediately back into a really hot oven. It is as simple as that. The best fats to use are lard, dripping duck or goose fat. Some swear by vegetable oil, but this can make them greasy if not used sparingly.